Vivienne knew of beasts that were large, and beasts that were vicious, but she knew of no creature that was both large and vicious enough to inflict such terrible wounds on a Winged Dog. Even if two Winged Dogs were to clash, which was unheard of, their claws were not sharp enough to make the awful gashes this dog had suffered. Strange and terrible things are happening in Vivienne Small’s world. A Winged Dog has fallen from the sky, carrying an ominous note. She sets out to figure out what is happening, and soon discovers that the City of Clocks is under siege from terrible vercaka, the like of which have never before been seen in Vivienne’s world. Back in the real world, Tuesday McGillycuddy and her mother Serendipity Smith are very worried. Famous writers from around the world are disappearing, only to reappear in strange places, often with mysterious injuries. Tuesday wonders if she is the only one who can figure out what is happening – and soon she and Vivienne are working together to try to fix the problem. 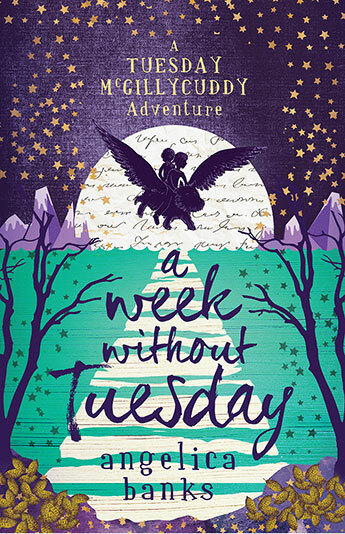 A Week Without Tuesday is an action-packed, warm adventure, a sequel to Finding Serendipity, but standing alone enough to be enjoyed by readers not familiar with the first. Tuesday and Vivienne are brave, generous and loyal protagonists, supported by a a varied and interesting cast. The fantasy world Vivienne inhabits, and the wider universe which houses the worlds created by writers is intriguing.